Last edited by Peter on 22 Nov 2017, 16:50, edited 1 time in total. Wonderful and a big applause for the fast painting friend of ours! Last edited by Peter on 22 Nov 2017, 16:51, edited 1 time in total. Sorry its should be a D! My little contribution is ready. 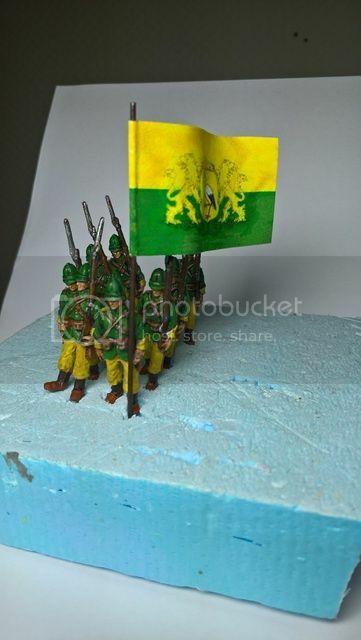 This is a unit from one of the most famous battalions ever..... A.D.O. Bravo! dykio,for your colorful marching column,i love it. It will be a VERY colourfull column! Great work, Dykio! Great work and a unique theme for the parade. I thank you so much for your initiatve and I hope this could together with the other fine entries push at least 5 or 6 people to move the brushes and start painting for the Group Build 2017. Oops. Didn't see this thread earlier on. Well - mine are representing the Westphalian light infantry regiment of 1810. 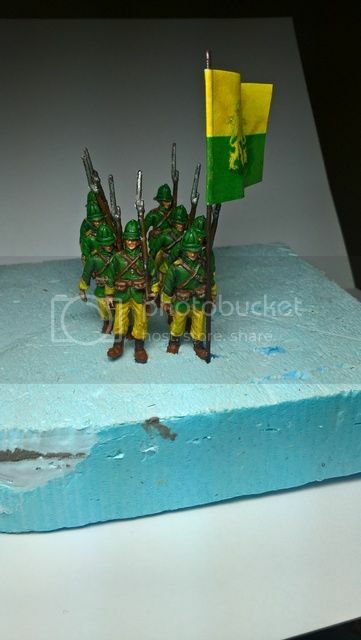 Next will be Prussian 7yw grenadiers, but that will take some time, although I've already started to paint them. ADO Den Haag? What a great idea! "They shoot! (Not guns - footballs) They score! I miss one figure carrying a football! That would make it complete! Excellent! This is what I mentioned with using your imagination! Everyone can do this! So come on and join us! I would like to post my contribution to the Great Miniature Figures Parade 2017. A few years back I can remember my great confusion over trying to find out how to post pictures,and finally it was Mrs B,who won through for me and found the way I could do such a thing,thus saving the last remnants of my own hair at that time from being ripped out by the roots by my good self.
" He He,It fell out anyway.
" poor bb,suffered greatly,as did Toddy their small dog choked himself near to death trying to eat the stuff that had fallen on the floor roots and all." " It was not a pretty sight or sound,"
Ah! a little bit of confusion,it was Jans Home Address our member Giovanni needed,and not info on how to post pictures here on the Forum. I've just finished painting the drummer, sergeants and flag bearer for my contribution to the group build. So my work is done for now. The flag bearer holds the "Regimental Colour". Now I really want to see some more contributions! Bring them on, guys! Last edited by Peter on 22 Nov 2017, 16:52, edited 1 time in total. Jolly Nice Marvin! You have a good clear eye for sorting out the finer details! While I tend to mortar over mine. . . . . . - .. . -- .